When RideNow Powersports recently compiled their list of the most popular UTVs on the market, an intriguing trend emerged. An amazing 6 spots on the top ten list were occupied by one manufacturer – Polaris. Clearly, the progressive American company is doing something very right. AIRAID is ready to help you take your Polaris to the next level of performance and protection with the direct replacement AIRAID 850-600 air filter. The 850-600 fits a wide range of 570 and 900 Polaris models built between 2012 and 2017. The performance benefit comes with the fact that the AIRAID 850-600 flows significantly more air than the restrictive stock filter with a paper element. The AIRAID filter media is composed of an oiled cotton gauze and non-woven synthetic material. The added airflow creates the potential for better throttle response and power over the full performance spectrum. The potential performance boost that the AIRAID 850-600 air filter can provide does not require any additional engine modification. 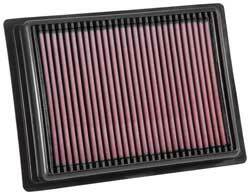 The filter is designed to perform within the specifications and limitations of your stock Polaris engine management system. The AIRAID 850-600 is also a highly effective in the filtration department. The same filter media that lets your Polaris breathe offers up supreme engine protection. The multiple layers of protection trap and hold dirt, dust, and other contaminants to keep them from destroying your investment. All of this performance and protection comes in a filter that is fully washable and reusable. This puts an end to the expensive cycle of buying, using, and disposing of traditional paper filters. A simple cleaning and re-oiling is all that is needed to get your Polaris back on the trail, the job, or the track. Every AIRAID filter is encased in a body that is made from hand-poured urethane that won't crack or shrink in the often brutal environments to which they are subjected. 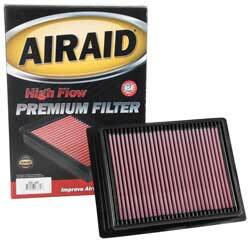 Additionally, AIRAID filters come with a reassuring "No Hassle" warranty. Check the extensive application list below and take your Polaris to the next level with the AIRAID 850-600 direct replacement air filter.